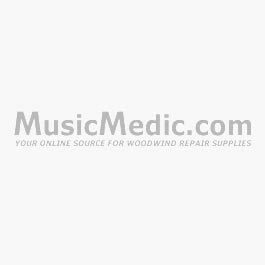 Pro Flute Head Mandrel We’re confident that our precision 100% stainless steel Flute Head Mandrels are the industry’s finest. Tapered to match the head joint, these mandrels can be used for checking straightness, burnishing, dent removal, and for holding while polishing or completing work on the head joint or lip plate. The long taper also allows the mandrel to fit inside the head joint even if there are some dents and damage. This model is fitted with a hexagonal delrin stopper to prevent the mandrel from being inserted too far and a stainless hexagonal handle that will keep the mandrel from rolling around on the tool bench and can be securely chucked in a vice. If you already have our flute body mandrel, you know the fine quality of this tool. All mandrels come with our protective blue mandrel guards. Economy Flute Head Mandrel This mandrel is the same as the professional model, only without the hexagonal handle and delrin stopper. Technicians can make their own handle or use with our dent rod.